Following petition and court confirmation of a sale of real property by a personal representative, use a personal representative's deed of sale under NRS 148.280 to convey real property from a decedent's estate to a purchaser. The sale must be confirmed by the court within 30 days, and the order confirming the sale recorded in the recorder's office of the country where the subject property is located. The personal representative (PR) is an individual with a fiduciary obligation to distribute the decedent's assets in accordance with the will, if one exists, and following the relevant laws. Letters issued by the court authorize the PR to administer a decedent's estate using probate. Deeds executed by personal representatives must meet all state and local standards for form and content. In addition, they name the PR as grantor and reference the decedent whose estate is being probated. The deed also identifies the judicial district and county processing the probate of the estate, and recites the case number and details about the court order confirming the sale. Record the completed PR deed in the recorder's office of the county wherein the subject property is located. 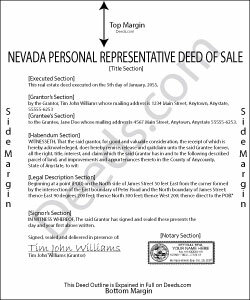 Notice prior to sale may be required, depending on the provisions of the decedent's will. Always consult an attorney licensed in the State of Nevada with questions regarding personal representative's deeds or any other probate issues. Tommy P. said: This was simple! Thank you!